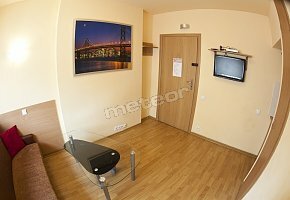 Flat consists of: room, kitchenette, bathroom. Apartment is equipped with: TV, bedclothes. Kitchen is equipped with: dishes, cutlery, cordless kettle, cooker, fridge. Bathroom is equipped with: toilet, wash-basin. We invite you to take advantage of our offer - satisfaction guaranteed. Rooms with floor area of 20-55 m2, comfortably furnished, with bathrooms. Rooms are equipped with: wireless Internet access (Wi-Fi), TV, coffee and tea making facilities. Some rooms are equipped with air-conditioning. The bus station 600 m.
Rooms are equipped with: radio, TV set, Internet access. The complex is on the fenced ground. At disposal: kitchenette, generally accessible bathrooms. On the premises parking. WE INVITE YOU ALL YEAR ROUND!!! On the premises: parking lot, ski equipment rental. Additionally on the premises place for grill. For the active guest stud farm, indoor swimming pool. We offer possibility of home-made full board. The facility is located near the centre. Our advantages: a perfect place for active rest.